Ajax midfielder Frenkie de Jong looks like he’s going to be one hell of a signing for Barcelona next season. 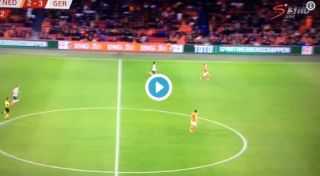 The young Dutchman shone again in action for the Netherlands last night in their defeat to Germany, with this superb turn below sending Real Madrid midfielder Toni Kroos spinning. Remarkably, it’s not that long ago De Jong did this to Kroos’ Madrid team-mates Luka Modric and Vinicius Junior in that famous Champions League win for Ajax at the Bernabeu.